Traditional Mexican cuisine has sparked the cravings of many over its long, flavorful history. As one of the most versatile and varied cuisines, the cultural aspect of Mexican cuisine takes on a personality of its own. Mexican cuisine has a history of incorporating fresh fruits and vegetables with local wild game. Over the centuries, traditional Mexican cuisine was subject to the influence of other nations. While ingredients and cooking methods have changed over the course of history, the traditions of Mexican cooking have proven resilient, reflecting outside influences yet retaining distinct cultural characteristics. The following eHow.com article details a brief history of Mexican cuisine – including cooking methods, cultural influence and common ingredients. Feed your brain some flavorful Mexican cuisine facts… there are plenty! Mexican cooks use lots of spicy peppers. 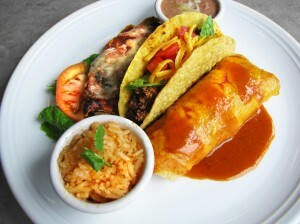 Lovers of Mexican foods enjoy it for its flavorful kick, use of fresh aromatic ingredients and colorful presentation. Mexican cuisine incorporates the cooking of ancient Aztec and Mayan Indians with ingredients and cooking techniques that originated from all over the world to create its unmistakable flavor. Many would like to learn to cook Mexican food, and find themselves better equipped once they understand some basic Mexican cooking facts. Many believe that chiles, one of the most recognizable flavors in Mexican cooking, was originally cultivated in South America. Birds disperse the seeds, and may have carried them throughout the Americas. Mexicans continue to use dozens of varieties of chiles in cooking. Anchiote seeds and paste often season chicken and fish; dried and smoke jalapeños give Mexican soups, salsas and sauces a smoky flavor. Mexicans cooking also uses canella (white cinnamon), which has a more delicate flavor than its American counterpart. Each region in Mexico has its own type of food. Meat dishes are popular in the north, while in the south more dishes with vegetables and chicken are common. Communities along the sea enjoy a lot of seafood dishes, fish like grouper, red snapper, mojarra and snook. Lobster, crab and oysters are abundant. Some Mexican recipes incorporate influences from South America, the Caribbean and Africa. Common foods, such as tacos and tamales, receive a special touch in each region of Mexico. White corn, beans, squash, tomatoes and chiles are the staples that have formed the foundation of Mexican cooking. The Mexican Indians relied on the combination of corn and beans for their protein, and they included small game, birds and fish whenever available. They either simmered or smoked the food. They did not have bread, but invented tortillas made of corn.When the Spainards arrived in Mexico, they brought influences from the Romans: wheat, bread, olives and olive oil, the Germanic tribes: pork and lard, and the North African Moors: sheep, chickens and spices, such as cinnamon and cumin, ruit, rices and nuts. The Mexican Indians incorporated these ingredients into tacos, stews and tamales which we now consider typical Mexican cuisine. Those wishing to learn authentic Mexican cooking, can take a cooking vacation to the country. Hands-on classes that teach their most adored recipes made with fresh vegetables, herbs and spices often include trips to the market. Instructors will talk about the historic and cultural background of the food. Students experience food and life the way the natives do. Mexican cooking only requires a few basic tools. A tortilla press has two flat plates made of metal or wood, hinged together. The cook used an attached handle to flattens a ball of dough for tortillas. Mexican cooks use a comal, a cast-iron skillet without sides, to cook tortillas or other ingredients that contain no oil. Mexican cooks are usually not without a molcahete and tejolete, a mortar and pestle made from volcanic rock, to grind their herbs and spices. Mexican cuisine has always been an exciting and flavorful adventure for people all around the world. Experimenting with a variety of Mexican food dishes will bring you closer to the history of Mexican cuisine and allow you to enjoy all the qualities of this great culture. For authentic Mexican cuisine that you can get excited about, check out our full menu. From burritos to fresh seafood plates, we have everything the steak-lover and vegetarian alike can appreciate. True Mexican cuisine is our passion, and you’ll taste the difference here!